There is a Potomac Yard Metro Planning Advisory Group meeting tonight that is open to the public. This would be a great opportunity for anyone that wants to speak out on the elimination of alternative D2 from consideration to do so! Here is the info: 6-9PM, Room 1101, Sister Cities Conference Room, City Hall, 301 King St. For more information, contact Valerie Peterson at 703.746.3853. Below, we discuss why alternative D2 should not be thrown out. You can also read our previous post on the subject as a primer. The recent elimination of alternative D2 by the PY Metro Feasibility Workgroup was short-sighted. Several readers of our previous post on this subject wrote letters to the Mayor and City Council supporting points the post made. I had an opportunity to read several responses back and they seem to all seem to be the same response from Vice Mayor Kerry Donley. Here is Donley's response, which I believe does not provide a clear reason for the elimination of option D2 (similar to the picture above and to the right). Thank you for your recent note about the Metrorail station at Potomac Yard. I believe that a Metrorail station at Potomac Yards is essential to the proper development of this site together with our goal of getting more people, residents and commuters alike, to use mass transportation. The committee examined many aspects of the candidate-build alternatives and we have opted to concentrate our efforts on the "A" alternative and the two "B" alternatives. There are three primary objectives which we used to arrive at these decisions. First, the capital costs associated with the possible station need to be realistic particularly since the station is planned to be financed through developer contributions and public bonds and then repaid through a special taxing district. Some of the other alternatives carried substantial up-front construction costs which made them too expensive to consider. Second, some of the alternatives carried significant construction difficulties such as track realignment or long-term construction schedules which made them less realistic. Finally, the options moving forward accommodate more commercial development as opposed to residential development making them move viable as commuter alternatives, with residential areas being served via circulator bus systems. The City still faces significant financial considerations for the surviving alternatives, particularly financing the construction costs and overcoming construction issues relating to the National Park Service and existing railroad right-of-way. We will be getting more information about these issues as well as more information from Metro regarding ridership information and the timeline for their procurement and construction processes. I do agree with some of Vice Mayor Donley's points in his response to many that e-mailed their concerns about the elimination of alternatives C & D. For example, a Metro station at Potomac Yards is essential to citywide goals. 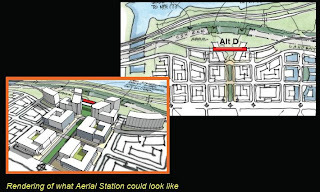 The station is especially important to achieve an urban, walkable, and transit centric Potomac Yards. However, as stated at the Mayor's Institute on City Design, proximity to the Metro station has a significant impact on land and property values, and therefore profit for any developer. The Workgroup's own analysis shows a shorter payback horizon and a higher developer proffer with a station located at the center of Landbay F.
The below-ground alternative seems prohibitively expensive and was dropped back in May, but the estimate for the aerial station in alternative D2 might be within reach for a developer. The extra $60-80 million might be made up with the vast improvement on 1/4 mile walkshed. Many of the arguments for this improved walkshed have been made over and over again by those on the Workgroup as well as the panel from the Mayor's Institute, including Christopher Leinberger. Note from the following images how far alternative B3 falls from the nearest development. Another key point to consider is the impact on traffic. The Vice Mayor points out, "the options moving forward accommodate more commercial development as opposed to residential development making them move viable as commuter alternatives, with residential areas being served via circulator bus systems." How does making the station further away from both residential and commercial properties help this goal. Alternative D2 is much closer to the greatest density commercial and residential property of Landbay F. If the Metro station is within close walking distance of the greatest density portion of the PY redevelopment, as well as within walking distance of Arlington's PY redevelopment, a greater proportion of travelers to and from this location will utilize transit instead of automobiles. 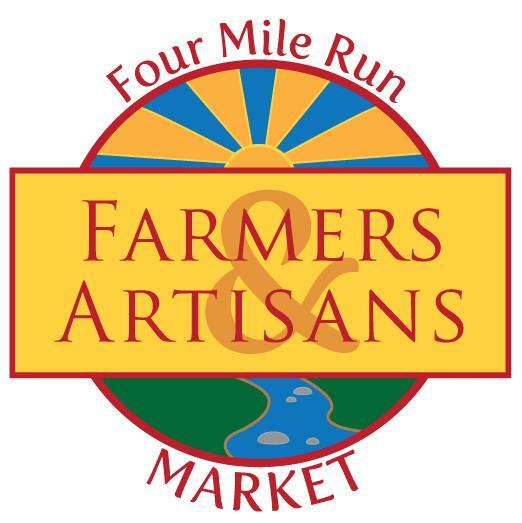 Has Alexandria even talked to developers on the other side of Four Mile Run that would stand to benefit greatly from alternative D2? As for Vice Mayor Donley's assertion that some of the alternatives were docked because they will be especially disruptive to existing operations, the Workgroup chart (shown atop our last blog on this topic) actually shows options A and B2 as being the most disruptive to current Metrorail operations. All other options were listed as having equivalent impacts. If the City is concerned about the cost and time of studying too many alternatives, throw out alternatives A and B2. B3 and D2 seem to provide far and away the most bang for the buck with the lowest disruption to service. The City should utilize its hard earned AAA debt rating and be willing back alternative D2, which truly achieves the type of urban, transit-centric community staff and City Council rightly promote. 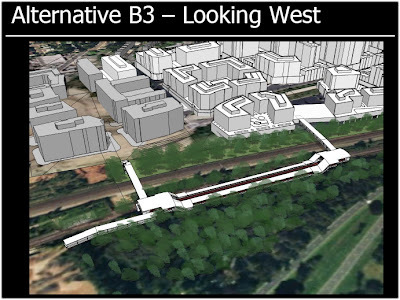 Municipalities across the nation study the forward thinking planning by Arlington when creating the Rosslyn-Balston corridor (30+% of Arlington's tax base on about 10% of its land, all due to good planning). Alexandria has an opportunity to do something that adheres to urban planning best practices, or something that misses the mark. Option D2 needs to at least remain in contention or people will look back in 30 years and say the City provided an infrastructure amenity, but only reaped a fraction of the potential benefits.